The Royals scored three runs in the first thanks to a Twins blunder and a Sal Perez blast, but Lance Lynn righted the ship, the bats got rolling and the bullpen had an outstanding game. Minnesota pulled out the victory, tying its biggest comeback of the season, and also sealed the series win over Kansas City. The heroes were Ryan Pressly, Brian Dozier and Bobby Wilson. Believe it. Credit to Lynn, he got back on track despite the awful start to the game. He struck out the leadoff man, gave up a single, but then appeared to induce a potential inning-ending double play. Instead, Jorge Polanco couldn’t handle the feed at second and everybody was safe. Perez went down and launched a three-run homer on a ball that was below the zone. From there, Lynn gave up just one more run through five innings. Lynn went back out for the sixth inning and opened things up with a hit-by-pitch followed by a walk. Ryan Pressly came in and hit a batter of his own to load the bases with nobody out and the Twins holding just a one-run lead. Pressly retired the next three batters he faced to keep things clean in the top of the sixth. The bats provided some breathing room in the bottom of that inning, as Brian Dozier hit a two-run homer and Logan Morrison added a solo shot. Wilson had a great day at the plate. For real! He hit an RBI single with two outs in the second inning, added a run-scoring double in the fourth frame and then singled in the seventh. Altogether, the Twins had 15 hits with three from each of Wilson, Dozier and Joe Mauer. Jake Cave was 2-for-4 with a triple. After Pressly’s impressive Houdini act in the sixth, Zach Duke followed with a scoreless seventh and Alan Busenitz, who was activated as Addison Reed hit the DL, handled the final two frames. Busenitz gave up a solo homer with two down in the ninth. Next up for the Twins is a four-game series against the Rays at Target Field to close out the first half. After getting off to a bit of a sluggish start, Tampa Bay has gone 20-10 over its last 30 games. This is a fun game to look back through the play log over at FanGraphs. After that Salvy homer, the Twins' win expectancy was just 25.9%. Then, despite holding a 5-4 lead at the time, they had just a 39.9% win expectancy before Pressly worked his magic to get out of that jam. 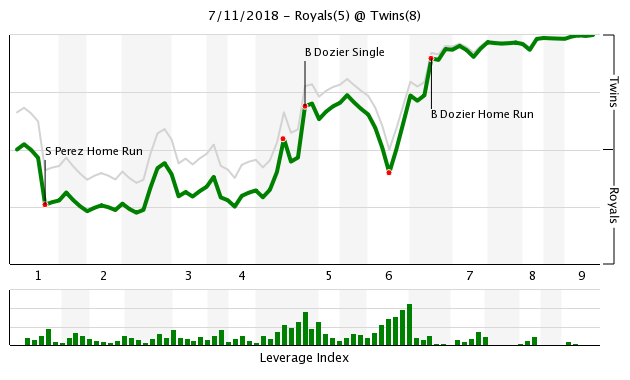 Dozier's two-run blast swung the Twins' win expectancy all the way up to 89.8%. Such a huge sing there in the sixth inning. I guess we have a new set of definitions.Lynn did not right the ship, he stumbled forward and the team rescued him.I am not a fan of the quality start and this was anything but quality. He was pitching against the Royals!Thank god we have the easiest schedule in the league going forward.Then we can pretend we righted the season - NO. Sorry to be so bitter Tom, you do a great job, but this team left my depot a long time ago. Offense!! Now if Escobar could get going again. Cave is really fun to watch. I'm glad to see Dozier beginning his annual second half surge. Baseball is a team sport. Everyone stumbles and it's OK. The others lifted him up like they are expected to do. Well, nothing like a little excitement. 10 games left against the Indians. 34 games left against teams weaker, perhaps, than the Twins. Maybe Dozier is increasing his value, as is Lynn and Duke. Of course, it should be a slam-dunk on getting rid of potential free agents, if they are underperforming AND COULD possibly be replaced by hungry bodies in house (Goncalves, Moya and Gordon). Hey, on a side note...seven doubles for Boibby Wilson, half of his hits (almost). It's not lights out by any means, but I think righting the ship after what happened was a great way to put it personally. Twins took 6 of 7 against a couple of bad teams. Just what they needed to do. Looking forward to tomorrow's game against a team playing well. Easy to be cynical, I guess. I'm enjoying the streak. Baseball is unique in that it is an individual sport played as a team game. food for thought- with all the shifts due to analytics would the the Twins record be any different without them? From the Twins defensive standpoint. Do you think Joe has adjusted right before our eyes his swing? Could he be beating the outfield shift with his swing geared more to up the middle? I’ve always thought of having the ability to hang with it on a day when you don’t have your best stuff as being one of the marks of a good player in any sport. Sounds like that’s what Lynn did. Who will hit .200 first? Sadly, I think the latter. Love your semi optimism, but as long as LoMo, Grossman, Kepler, Cave ( we will see on him), are regulars, and our hammering the few guys in the bullpen, this team cannot, I mean cannot beat average or better teams. Right on time, basically after we are buried for the season. His slump helped bury the Twins early on. Hopefully he's building his trade value. Even thought the Twins are out of it, ten games back, its still nicer to listen to winning baseball. It will be interesting to see how they do against a team on a roll like Tampa. On a side note, is there a spot on Twins Daily that lists the daily roster transactions?? I was listening last night and when they mentioned that Busenitz was pitching, I was wondering 'when did he get called up'? Jake Cave is going to be our Max Muncey. I prefer seeing Cave's name in the lineup over Buxton. Go Twins, sweep TB! 1.256 OPS over the last six. Though it's funny that three years ago people complained that he was a first-half only player and always faded down the stretch. The first half/second half thing is likely our imagination. More accurately, Brian Dozier is capable of going nuclear for weeks and months at a time. When he does, he carries a lineup. The twins are 8.5 back and have ten to play against the Clevelanders. They are certainly not out of it, especially since they're a team that looks better on paper than they do in real life. They could be due for some regression to the mean in the nicest of ways. Check out the minor league report each day. Top section is moves. Kepler and LoMo have better underlying numbers that indicate their results are lower than expected and could be due for a bounce back. Buxton will likely be back at some point after the break. Grossman and Cave will not be playing every day at that point, more filling in at DH, OF a few days a week. The pen has been relatively solid and Pressley and Hildy look to be rounding back into form. Taylor Rogers had a nice outing too and they used Buesnitz in a relatively important situation. It's time to hold pat until right at the deadline. If they can get within four or five, you buy a backup catcher, sell a bullpen arm and see what happens. P.S. If the Indians lose 3/4 vs. Yankees and the Twins win 3/4 vs the Rays we'll be 6.5 out at the break. That doesn't seem totally unreasonable. I dunno, Polanco should've turned two on that ball. It wasn't a gimme but it was there. Yeah, Lynn's gotta buckle down and get out of it but I thought he pitched relatively well and kept the Twins in it after some bad first inning luck. I love how beating two of the worst teams in major league baseball's recent history suddenly has people thinking playoffs again. Someone queue up Picard's facepalm for when we stop playing AA teams. Twins Unlikely to Sign Kimbrel, Keuchel — Wait, This Sounds Familiar!